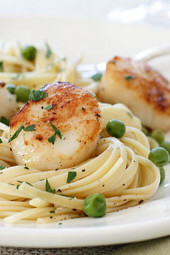 Scallops are great for a quick meal any night of the week and are a real treat. They can be quickly sautéed, then added to salads like this Scallop and Baby Green Citrus Mojo Salad, and this delicious Scallop and Grapefruit Salad, but once in a while when I want something more substantial, I love it with pasta. Here I tossed it with some pasta and peas, for a dinner that took less than 15 minutes to make. I love sea scallops and it takes very little effort to get delicious results. For best flavor seek out the freshest scallops. Before cooking remove the small, tough muscle attached to the side. You can easily double this recipe for four servings. Reserve 1/2 cup of pasta water before draining, drain the pasta and return to pot. Add parsley and 1 teaspoon of olive oil. Stir, adding reserved pasta water a little at a time. Adjust salt and pepper, to taste. Meanwhile while the pasta is cooking, season the scallops with salt and pepper. In a large skillet, heat butter over medium flame. Cook scallops until browned on one side, 2 to 3 minutes. by viewing them from the side). Be careful not to overcook or they will become tough. Made this tonight and husband I both agreed it was good but needed a little something-something. It was a little bland. I feel like it needs some heat and acid. 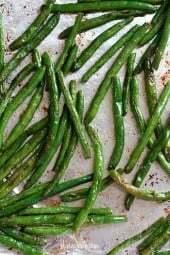 I will make again but next time will add some crushed red pepper, garlic and lemon juice. Just fixed this for supper It was delicious. My husband liked it We are on WW together. added more garlic powder on top of each dish and a splash of lemon. Delish! My partner just cooked these for me and OMG this is the best pasta we’ve ever had at home! made zero changes to your recipe, and will be making it again (weekly i think 🙂 ). so happy i’ve discovered your blog! Made this for a quick dinner tonight and was very happy! Simple and delicious, one of my favorite combinations 🙂 Thanks! This one's a keeper! I just made this today and it was delicious! I never had the courage to cook with scallops before but it seemed so easy that I was brave enough to try. Thank you! I added 2 cans snow's minced clams and half can of clam juice after sauteeing the scallops. Yum! I also used mini scallops (I thought I was buying the big ones) and cooked them for less time. Sooo good! Love this, great idea! Just tried it out tonight and it was phenomenal. Great combo! Is it flavorful? It seems like it could be a little bland? This makes me want to try scallops too! Made this tonight with the shrimp substitution because that's what I had — delicious! I was afraid my husband wouldn't like it because we usually eat pasta with more sauce. He loved it! Definitely will keep this one in the rotation. what is the exchange for shrimp because I am allergic to scallops? 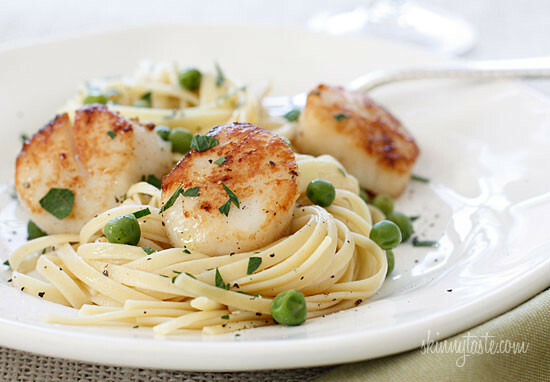 This looks great, but 1 cup of pasta and only 3 scallops? Doesn't seem like much. Love how awesome that browning is on top! I'm a sucker for scallops and these look magnificent! I'm sad to say, I have never had a scallop. I need to try them! Your dish looks amazing! Looks great! Can you recommend a good low carb pasta? Just look at those perfectly browned, tender scallops. This is a great way to make a quick weeknight meal feel fancy. Oh my gosh, what gorgeous photos Gina! Scallops have got to be one of my most favourite types of seafood but I don't buy them often since the fresh ones are quite expensive. I love how delicate they are, and how few additional ingredients they need in order to taste amazing. Great post! Thanks Angela, yeah I save them for special nights. This looks awesome! I think I'm going to have to get a zucchini spiralizer and try this with it. Loving the photos. Our mouths are literally watering!!!!! What a perfect spring meal! It looks so delicious, Gina! This looks sooo good! Thank you! That dish looks so yummy. Its great for a quick week night dinner. being vegetarian i need swap the scallops with some veggies though..
Gina, can you substitute shrimp?? or chicken?? in this? Would you know the point difference??? I wish I would think to cook with scallops more often! You have quite a few great recipes on your site that use them. Yes, I really love them, and they are so quick. Really hot pan, butter and olive oil. Sear on one side (DONT TOUCH!!! ), Turn with tongs when it will release- about 2 minutes. Cook one more minute, they should still be springy to the touch and a have a beautiful caramel color on the seared side. Serve right away. 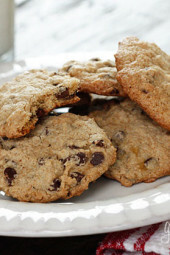 My son told me about skinnytaste, and I found this recipe. Tried it per the recipe the first time, but will try it will assaparagrus the next time. 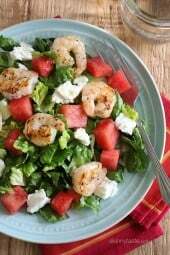 This is a great "date night" meal especially with a good bottle of white wine. Unfortunately, that ruins the calories, but it make for a great meal. I made something that a friend gave me the recipe for and it came out pretty bad (not from your website). My husband wanted to know why I dared to use a recipe that wasn't yours. Just thought you'd like to know that. Every single thing I've made from your recipes have been delicious. He's even eating things that he doesn't usually like. I made your turkey chili soup this weekend and he hates chili. LOVED your soup though. You really need to have your own show. I'm so happy to hear that!! Great attitude to have!! Good luck C! Perfect, don't know why I didn't think of that one. Thanks for such a quick reply. We both just started WW this past week and I have been huffing and puffing the whole time. I found your blog and now I'm finally excited! I feel like maybe I actually CAN do this and not even feel deprived. Ive never been on a diet before and always have had body image issues. Im feeling so empowered now that I feel like I can control this instead of it controlling me. It has a ton to do with your recipes… I feel like I'm eating foods I love and everyone else is the one missing out. How great is it to full physically AND emotionally full?! Thank you Gina. That's what I will use….asparagus! 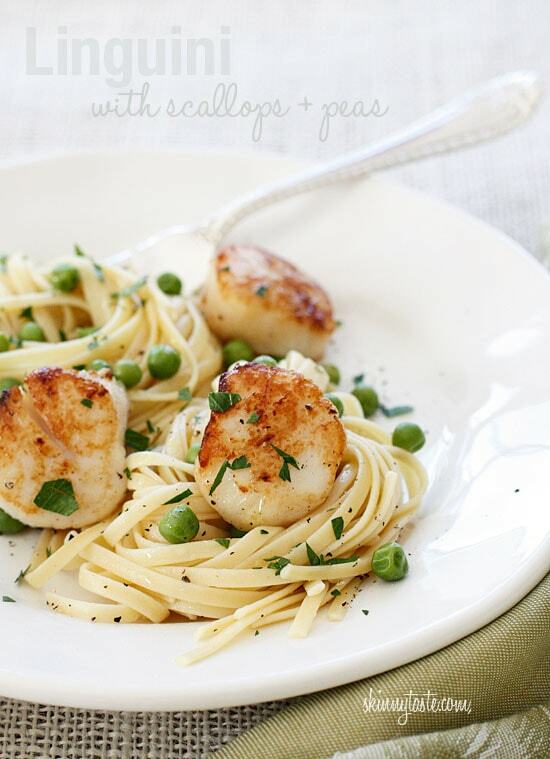 This recipe looks great and I adore scallops! But my DH just can't stand peas 🙁 do you have any other (non-starchy) vegetable suggestions?? Try a handful of fresh spinach or sauteed kale or mushrooms. This sounds so good, I can't wait to try it.